Separate Data for Excel separates an Excel worksheet into multiple worksheets based on criteria matched within data columns. 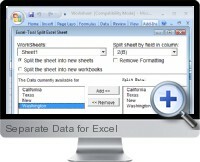 The Excel add-in provides an fast and efficient method for splitting Excel data into separate worksheets. Choose to split into new worksheets or workbooks. Specify multiple columns for data to be separated. Choose multiple criteria to for data to separated on each column. Option to remove formatting on new data files.